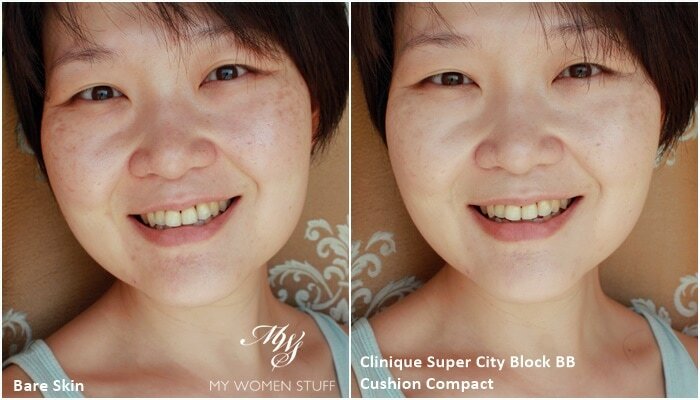 Home » Face » Foundation » Cushion Foundation Week Day 3: Clinique Super City Block BB Cushion Compact was a sleeper hit! Cushion Foundation Week Day 3: Clinique Super City Block BB Cushion Compact was a sleeper hit! 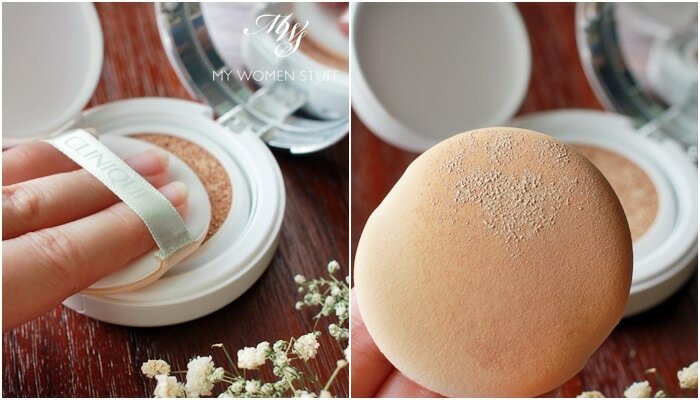 Welcome friends, to Day 3 of Cushion Foundation Week on My Women Stuff! This has been the new wave of foundations to hit our counters, popularised by Korean brands and formulations, so I wanted to keep it all in one place. What I’ll be doing over the next few days, will be to tell you what I think of the cushion foundation from a particular brand, and suspending all other regular programmes. The remaining cushion foundations will be from the Western brands, because that’s what I have on hand. At the end of the 5 days, I’ll do a quick round up with some general thoughts, and also tell you what I think about cushion foundations in general so look out for it then. Today’s cushion foundation from a western brand, turned out to be a sleeper hit for me. It’s the Clinique Super City Block BB Cushion Compact and it turned out to be pretty decent! I didn’t know that Clinique was also doing a cushion foundation, until one landed on my desk. It cemented my views on the cushion foundation wave that was lapping at the beauty shores. Similar to Bobbi Brown, I had never pegged Clinique for being at the forefront of new innovations, but this time, it would appear that everyone has gotten their ducks lined up all together, and are ready to release them on the world! This Clinique cushion compact offers SPF50 and PA+++ sun protection that is very high and broad-spectrum, and perfect for where I live. I however, use this on top of regular sunscreen, not as a replacement for it. I find it interesting that Clinique placed this in their City Block range of products, which is their sun protection range. Clinique is therefore positioning this as a tinted sunscreen/BB cream thing, which seems to jive with the Korean way of looking at a cushion foundation. The Clinique Cushion Compact Foundation comes as only 1 product – a case with the refill and a sponge. There is no refill offered in the same box, although you can buy refills separately. The refills are traditional cushion foundation packaging, with the cover connected to the cushion. The refill comes in a sealed pack for freshness and a new, sealed sponge. The packaging is otherwise quite standard, except that the cover is the typical metallic Clinique instead of a white to match the bottom of the case. The cushion is pretty typical in that it comes pre-soaked. The new ones will be sealed for freshness and to prevent it drying out, so you have to peel off the plastic before using. I find that the cushion is well soaked, so it’s easy for the sponge to pick up the product. As the cushion dries out with use and exposure, you will naturally have to depress a little more. Like the Iope one, you can use a tweezer to flip it over when it’s almost done, to use up what’s left at the bottom. Like all cushion foundations, slip your fingers through the band on the sponge, press it lightly on the surface of the cushion and then, PAT the product on your skin. The sponge picked up product quite easily without me having to press on it. That said, this is fairly fresh so I’d expect that. I found the texture of the Clinique Cushion Compact Foundation a little bit of an in-between. It wasn’t very lightweight, having a slightly creamy feel, but it wasn’t too creamy, as it still maintained a light feel. Coverage is sort of in between as well. I thought it had a fairly decent coverage, which surprised me, because I wasn’t expecting too much of this product! I follow up with a concealer if I want better coverage of blemishes and pigmentation, but on its own, it’s pretty decent as it stands. The other thing I quite liked was that the finish wasn’t too dewy or moist. Now, I know that the goal of most cushion foundation is to give your skin the dewy, glowy finish that people associate with healthy, translucent skin. But I don’t quite like that, because in this hot weather we have here, you’re more likely to look oily and greasy instead. Here is an idea of how it looks in a before-after photo using Clinique Cushion Compact Foundation in Light. There are 3 shades in this range – Light, Medium and Deep. I’m not too sure how deep the other 2 shades are, as I haven’t seen them myself. 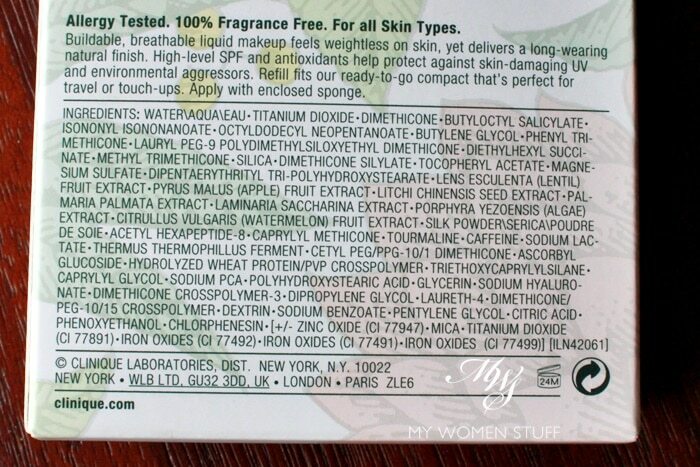 So, I’d suggest that you hoof down to a Clinique counter to test, although you can buy this online. 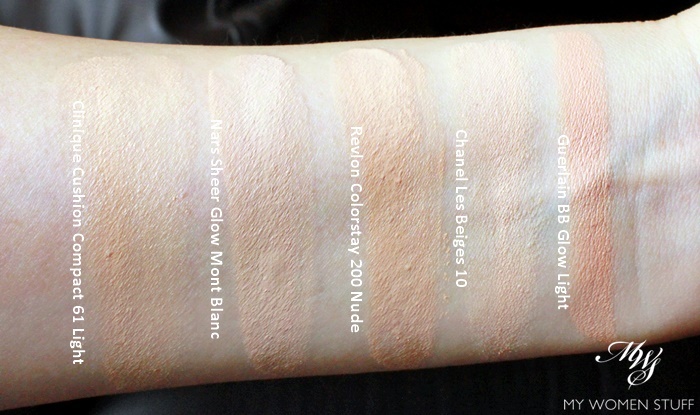 Here is a swatch of the Clinique Cushion Compact foundation in Light compared to other foundations I wear. While the Clinique cushion in Light has a slightly yellow tone, it’s quite light and neutral so I’d safely say that it would work for most fair skins. For those who are sensitive to fragrance in products, rejoice! 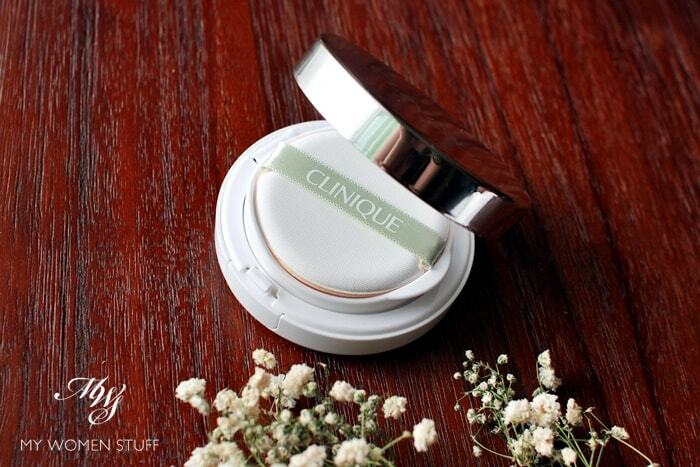 The Clinique Cushion Compact foundation is fragrance free! I liked that very much. Yes I do. I like the finish on my skin, its coverage and how comfortable it feels when I wear it. It isn’t too shiny or glowy, and I like that I don’t really have to top up with powder to hold the shine at bay. I also like the price-point, which is among the most affordable from the range of Western cushion foundations I’ve come across, in the department store brands. The Clinique Cushion Compact foundation has a lightweight texture but for me, it belies the coverage which is light-medium. I find that it isn’t too glowy or dewy in its finish so I don’t have to set it with powder. It is comfortable, the shade is a good match for my skintone, and it’s easy to use. All in all, a good effort from Clinique! 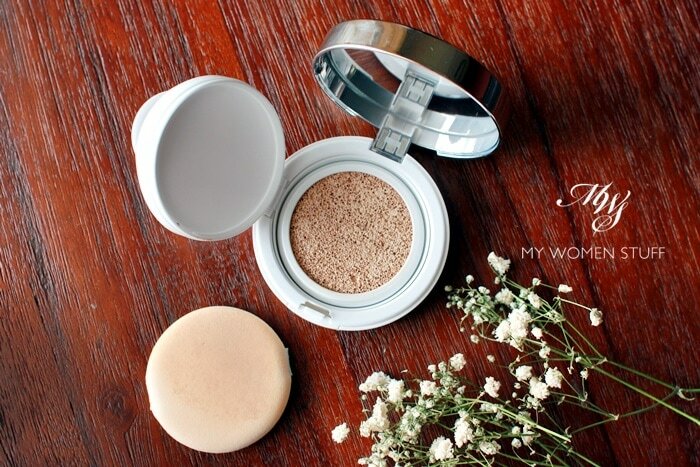 Does this western Cushion Foundation intrigue you? Have you checked it out? NEXT POST: Cushion foundation week Day 4 : Dior Diorsnow Bloom Perfect Perfect Moist Cushion Foundation is very K-beauty! Ooooh! This one looks awesome on you!! I wonder when it will come here? I hope soon! I like the coverage on your face – natural and illuminating as if you just step out into sunny day 😀 It’s surprising, though, as Clinique usually not quite outstanding with their makeup products, hehe. This one sounds pretty good, especially for casual/lazy makeup day, haha. Put on sunblock, the cushion and slap on tinted lip balm and I will get a fresh, sunny look! Thanks, and yep. This one’s pretty decent in terms of coverage which surprises me naturally. I didn’t peg Clinique to be the one coming out with a cushion that actually impresses me! LOL! Have you taken a look? Nice to know you found a cushion that you like! I dind’t see this in the Innisfree store when I was there – how strange! It sounds like a good one! I think it’s a cushion, the product name has “cushion” and the surface feels cushiony to me, haha. Is the refill compatible with any other cushion cases? Not that I can see unfortunately, based on the ones I tried. I like the look of this on you! The coverage looks decent and the finish looks natural too! I am new to cushion compacts and very intrigued to try them out!! So was really glad that I stumble upon your review 😀 The Clinique cushion compact seems like a really decent product for me. My only concern is that with puffs, they may absorb too much foundation and making the product run out quickly?!?! (I just need to be careful with budgeting my beauty products given that I am just a student LOL). So I am really curious how long did this compact last if I use it on a daily basis? Like at least 2 to 3 months or less??? Thank you!! Hi Carrie, not sure if you read my follow up round up on Korean brand cushions I’ve tried as well as the comparison between Korean and Western brands? To answer your question, the puffs do not absorb very much product but the cushion itself will dry out as you go along, due to exposure to the air. So, for budgetry concerns I wouldn’t pick a cushion, but go for a BB/CC Cream or tinted moisturiser or liquid foundation. In the alternative, pick a cushion that comes with a refill as that makes it less painful when the cushion dries out. I don’t use these often, so I can’t say how long they’d last. With daily use I’m hazarding a guess of 1-2 months? Depending also on how much product you use each time.